Charitable comes with a few settings that you will find in the WordPress Customizer. 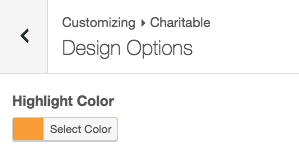 To change these settings, go to Appearance > Customize, then click on the Charitable tab. Under Design Options, you can set the highlight colour that Charitable will use for buttons, progress bar and other highlights. 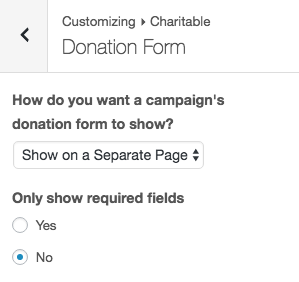 Under Donation Form, you can set how you want a campaign’s donation form to show, and whether you want it to only show required fields.